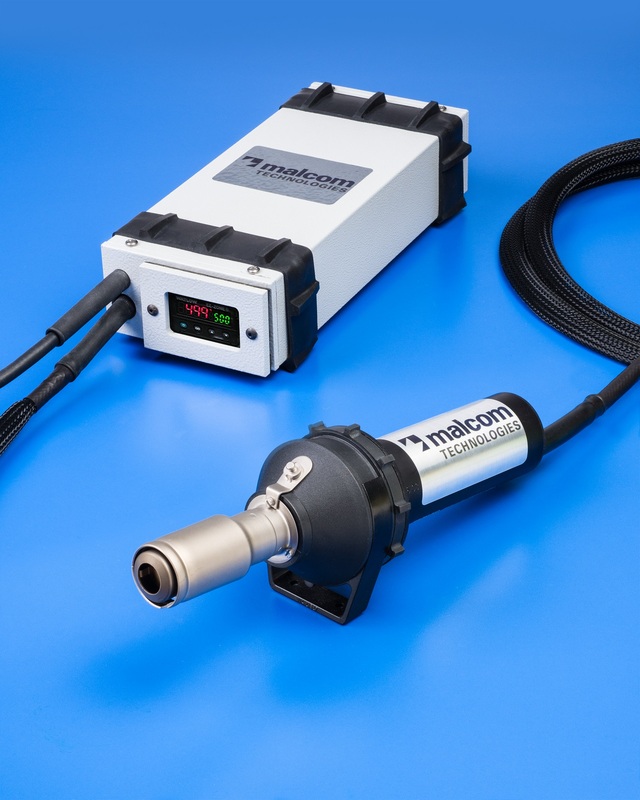 A fully portable heat gun kit that eliminates the need for power generators, propane, and open flames and lets users preset the operating temperature is being introduced by Malcom Technologies of Portsmouth, Rhode Island. The Malcom MCH-100-D Battery Powered Heat Gun is a lightweight, hand-held tool that reaches up to 900°F and features a programmable PID controller which can maintain the working temperature within ± 1°F of set point. Providing 2.66 CFM (75 liters/min.) air flow, this hot air gun incorporates a thermocouple inside the heating element housing for optimum efficiency and accepts over 100 different specialty stainless steel air nozzles. Ideal for repairing electrical wires, power lines, cable harnesses, and other applications using heat shrink sleeves, and heat shrink shapes and for testing heat sensors, the Malcom MCH-100-D Battery Powered Heat Gun weighs under 1 lb. and the 48V rechargeable battery pack less than 10 lbs. It conforms to several military standards including Mil-Std-810 F (511.4) Explosive Atmosphere Test for N-Hexane and JP-5 Aviation Fuel. The Malcom MCH100D Battery Powered Heat Gun Kit is priced from $5,495.00, depending upon battery pack and nozzles. Pricing is available upon request.